Since I began dressing in a seasonal, 33-item capsule wardrobe in March, I’ve noticed certain clothes emerging as most-worn favorites. Some of these items were worn so much that I ended up replacing them along the way. This is by no means a list of must-haves, but these pieces all saw a lot of wear, and they’ll form the basis of my year-round capsule wardrobe going forward. 1. Dark wash skinny jeans. I wore my last pair so much that I replaced them this fall with a high waist version. 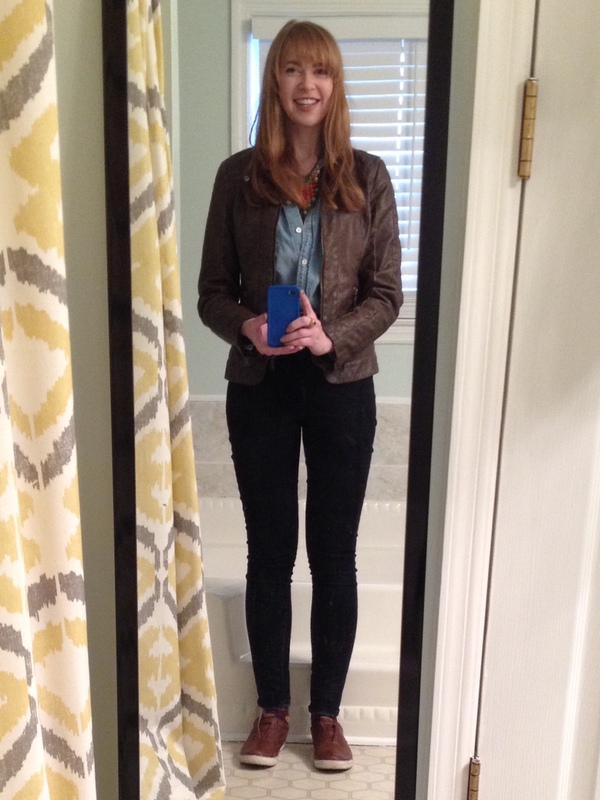 Other styles (straight leg, wide leg) are growing in popularity again, but I still like my skinnies best. They make an oversized sweater and sneakers feel polished, they work cuffed or long, and they compliment heels as well as they fit under boots. I’m a fan. I liked the flap pockets on my old ones, but my new ones are stretchier for an even better fit. After months of searching, I finally found the perfect one at the thrift store. I layer this under sweaters, over tops, wear it tucked or untucked, tied or belted, with a skirt or jeans…it’s incredibly versatile. My version has button tabs so I can roll up and secure the sleeves in warmer weather. This was a full-price purchase more than two years ago and has been a three-season wardrobe staple for me. 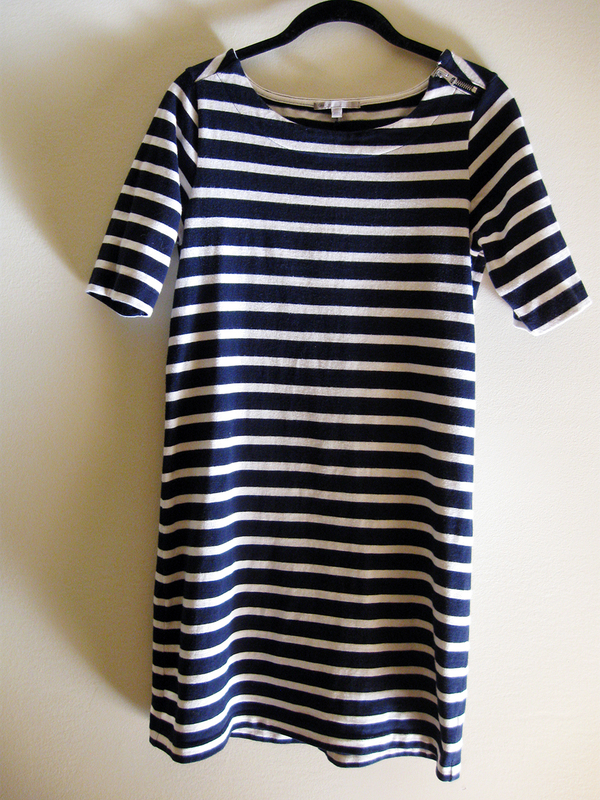 I loved wearing it with sandals in the summer and with leggings or tights and boots in the cooler months. 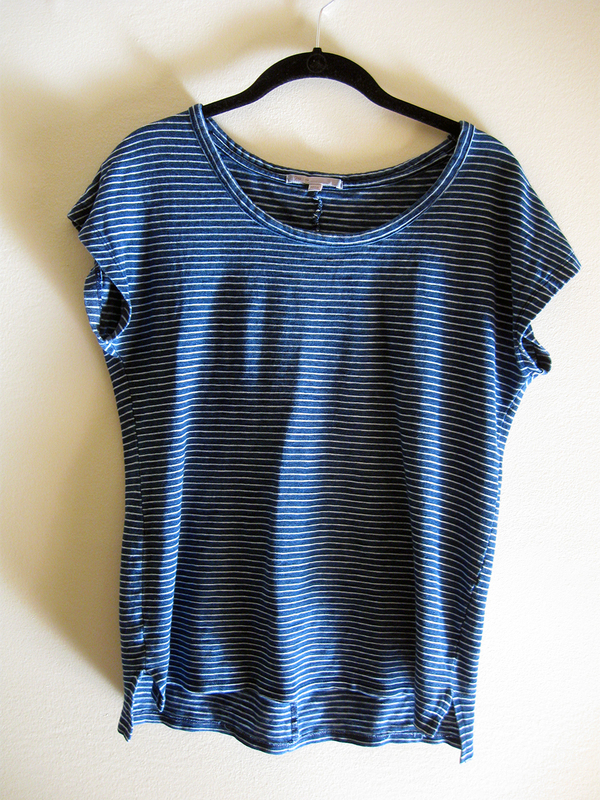 Before I found my chambray shirt, I would fold and tuck this one into skirts or pants. The first version wore out and was replaced in the summer. Both were found at the thrift store. This was another three-season piece with plenty of layering and styling possibilities. It will retire briefly for winter and likely return for my spring capsule. I already had a couple pairs of flowy shorts and was on the lookout for something a bit more casual and structured. It took a while to find denim shorts that weren’t distressed or cut offs. Oh, and they had to be the right length! This secondhand find made the hot month of August so much more bearable! This lightweight sweater is just my color and goes with more than you might expect. I like to be prepared for cool temps, even in summer (wishful thinking? ), and this folds up small enough to fit in my purse. It adds no bulk under a jacket and works under or over a belt. One of my few “dry clean only” items, this vintage find was probably my most-worn piece this fall. I especially liked it over button down shirts. This lightweight long sleeve tee feels perfectly, casually comfortable with jeans or shorts and makes a great base for a scarf or necklace. 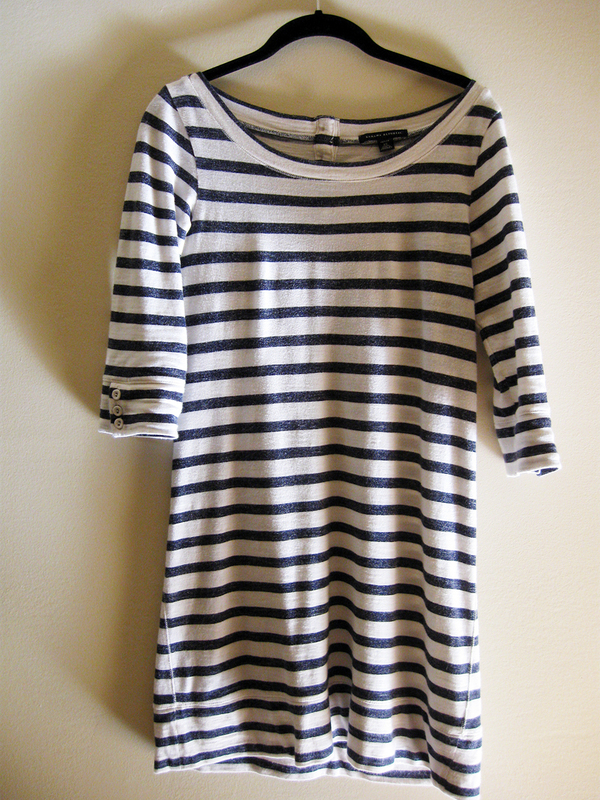 After beginning my capsule wardrobe and taking a shopping hiatus, this was one of the first pieces I bought. I had scouted it online and love the sleeves and neckline. It’s an interesting basic. I replaced my falling apart synthetic boots with these Frye leather boots (purchased gently used for 80% off retail!). I did have to stretch the calves a little in a really un-glamorous process involving screwdrivers (seriously DIY), but now they are a great fit with tights or jeans. They cost more than Target boots, but I’m glad I waited for a deal and made the investment. I plan to have these for years to come. Another pair of Frye shoes, these were a gift and purchased new. They are super comfortable, work with laces or without, and I like that I can chase my daughter around the playground in shoes I also wear around town. These are a very “me” substitute for gym shoes. I added this piece for fall, and I love it! I had planned to save up for a leather jacket, but this synthetic version works better for my life right now. I don’t worry about wearing it in the rain, working setting up vintage displays, or playing with my daughter. I’ll still save up for the real thing at some point, but in the meantime the pleather is perfect. Technically jewelry is not part of my capsule collection; I don’t count it in my numbers or swap it with the seasons. But I did find myself reaching for these pieces most days, and not just because my friend makes them! The stamped metal cuffs go with everything and feel like a signature look for me. Whew, you made it through the whole list! What were some of your favorite or most worn pieces this year? Note: I included links to the exact items or similar ones when necessary. You can see my actual wardrobe (on hangers or worn by me) here, here, and here. Much of my clothing was purchased secondhand or in previous season/years, so some links point to sold out or unavailable items. Visible prices are no indication of what I actually paid. So I’ve cheated a couple times. I had to temporarily pull out my big vintage fisherman sweater and my Sorel boots, and I’ve realized I really don’t have a warm coat or many sweaters left. I’m well equipped for most Southern winters, but last winter (and several days of this one) have pushed my mild winter wardrobe to the brink. My pieces consist primarily of lightweight “fashion jackets” that do little to actually thwart the cold. I’m keeping an eye on the thrift stores for a few warmer pieces, and until then I’ll pile on the layers. Thankfully, most days have lows in the 40s-50s, temps that are comfortably manageable with what I have. I’ve also decided to keep a few spots in my closet for vintage favorites. My small collection of vintage dresses contains more statement pieces than basics, so I haven’t figured out how to fit them in a 33 item capsule collection. But there are occasions that call for a statement. I’m bringing in a few of these pieces as a sub-collection. This season I have replaced a few items that no longer work. I bought a new pair of dark wash, high waisted skinny jeans since my others were wearing out and getting a little pointy “tail” in the back. Do you know what I’m talking about? Once it happens, the pants are pretty much done. The old jeans moved on to the “lounge wear” category (or more accurately, the “work wear” category when I’m setting up vintage displays or sorting through things in the garage). I also ditched the charcoal skirt. I didn’t try it on before including it in my collection (lesson learned! ), and it doesn’t fit well at all anymore. I still wore it once, but I immediately pulled it from my closet after seeing the baggy, saggy selfies. 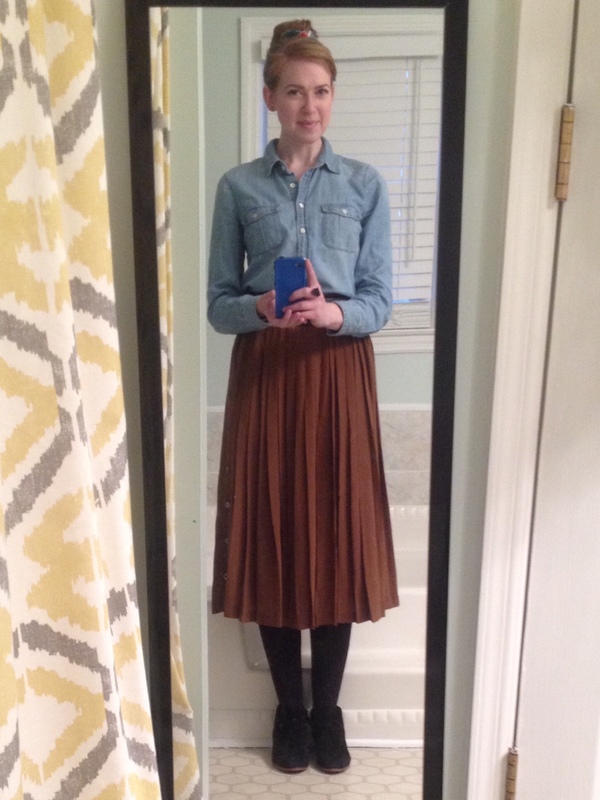 A plaid skirt (found on super sale!) has taken its place. While not as versatile, the new skirt is a fun piece that fits my style well, and I expect to wear it plenty this winter. Oh, and I added a couple new pairs of shoes! I’ll share my accessories at some point. When I did follow the rules, which was most of the time, I took some bathroom mirror shots to show how I put everything together. Fall clothes are my favorite, and they’re the easiest for me to wear. I really love these clothes, and I don’t have to think too much about them or work too hard to make outfits. I’m wondering if those two things aren’t related, and maybe that’s actually the crux of capsule dressing: effortless style. Do you have a favorite season for dressing? Have you found a way to incorporate statement pieces in a capsule wardrobe? Are you ready to try this in January?!? Wait, what?!? Does this sound familiar? For years, I catered to the “what if,” and I think this was the primary cause of my crowded closet. Even a serious shopping habit can be offset by ruthless editing, but I had a math problem; I kept adding without subtracting. There are benefits to being prepared, and holding on to things seems like a money saver. If I already have it, I won’t need to buy it…right? There is a certain comfort in having a stock pile of clothing (or anything, really), but life rarely shakes out exactly the way we anticipate. In reality, I will want to buy (or rent, or borrow) a new dress if I happen to be invited to a formal event. If I lose ten pounds, it could very well be during the winter, and those tiny linen pants will be of no use. I could gain ten pounds in the summer when those next size up corduroys won’t be wearable. In either of those cases, I would probably want to get something new to embrace my new size. Unusually extreme weather only lasts briefly, and I could probably manage a few days of snow by piling on lighter layers. If something comes back in style, there is little chance of me wearing the trend again and in the same way. Last spring I found a piece of advice that made letting go seem a little easier: store it at the store. Store it at the store. This one little sentence gave me some ammunition against the “what if” onslaught. I first read it here on Apartment Therapy, and this article on Untitled Minimalism expresses the concept well. I decided that if “what if” was my main hesitation in letting go, I would store at the store instead of in my house. If I could get a similar item for less that $20 in less than 20 minutes, I would definitely store it at the store. I recently had an unexpected opportunity to test the efficacy of the 20/20 rule. We needed a roasting pan (and by “we” I mean my husband, who is the chef in our home). When I went to look for the pan, I realized it had been in the drawer of our old oven. We had gotten new appliances, and I forgot to check the drawer before the old ones were removed. Since dinner depended on a roasting pan, I stopped by the thrift store and found one in pristine shape for $5. The errand took less than 20 minutes, including the time it took to wash the pan. I didn’t intentionally give away the roasting pan, but I saw how it might not be so terrible to find myself unprepared in one of those “just in case” moments. After that experience, I used the 20/20 rule as inspiration to give away some books I have already read, some art supplies I haven’t used in the last three years, and some extra plastic kitchen utensils that were taking up drawer space. I decided two slotted spoons were plenty, and in the unlikely event that I needed more, 20 minutes and 20 dollars would be more than enough to make that happen. If the item is easily borrowed, I can also store it at the store. I don’t need to hold on to that heavy carry on luggage with the marginally functional zipper; I have another one that works perfectly, and I can borrow one from family if I ever need two at once. Friends often borrow serving pieces from me. I like to entertain and have a large collection of vintage dishes, so these items are not burdensome for me to keep. They bring me joy and serve a purpose, and I’m happy to share them. My friends could “store those at the store,” in a way. In the process of minimizing, I found things I haven’t worn or used in years, things I was unlikely to wear or use in the near future. These are things I wanted to let go of, but I held on to them out of fear…because really, for me at least, the core of “what if” is fear…of insufficiency, inadequacy, of not enough. I no longer want fear as a motivating factor in my life. I don’t want fear deciding what stays in my closets or cabinets or drawers. So goodbye, dress that I kept because I was afraid I might need to wear it one day! That dress took up space. It occupied physical space that I would rather use for something I enjoy wearing often, and worse than that, it wasted emotional space. I want to spend more energy living my life in the present and less effort planning for what might be. Do “what ifs” interfere with your attempts to simplify? Are your “what ifs” motivated by fear or something else? What could you store at the store instead? Today is October 1st, a day I have eagerly anticipated for at least the past two weeks, because today begins a new round of Project 333! This will be my third cycle of the minimalist fashion challenge, and I am looking forward to trying a capsule wardrobe during my favorite season. If you are a new reader here or are unfamiliar with Project 333, here’s the one sentence summary: live for three months with a thirty-three item wardrobe. It is radical, but it is not militant. When I tell people about Project 333, the most common response is, “Wow, that’s so cool! I could never do that!” I get it. That’s how I felt when I first heard about Project 333 as well. I love shopping and have an eclectic sense of style, and I thought this sort of challenge would be great for people who didn’t like to shop and preferred monochromatic outfits. But sometime over the past year, a metamorphosis took place. I transformed from a curious observer into an impassioned participant. Finding blogs and pins of capsule wardrobes (both actual and aspirational) inspired me, but here’s what finally won me over to Project 333: it is radical, but it is not militant. The rules are offered as guidelines, a structure within which to challenge yourself. They can easily be adapted or omitted or ignored. There are no grades for perfection, no awards given for adherence, and no shame or consequences for mistakes or even failure. It’s just a practical, doable set of steps to try out dressing with less. So I adapted and adjusted and made it work for me. It’s my Project 333-ish. The asterisk (*) marks new items added to my wardrobe, the (V) signifies vintage, and the (T) means the item was thrifted. In case you’re counting, that comes to 26 items. I’ll include my shoes (which bring my count closer to 33-ish) and selected accessories in a later post. If you’ve been contemplating taking the plunge into capsule wardrobe land, now is a great time to start! The seasons are changing, the temperature is dropping (at least in my hemisphere). Nature is undergoing a wardrobe makeover and heading toward minimalism. There are so many good resources to encourage and inspire you (like this Project 333 Blog Tour, in which I’m grateful to be included). It does not have to be all or nothing. If you aren’t ready to have a closet quite this small, why not try packing up ten things and seeing if you miss them at the end of three months? Or donate one thing you’ve never liked wearing. Or try wearing thirty things for one month. Or spend hours browsing capsule wardrobes on Pinterest—hey, it’s inspiring! If you’re wanting to do this but have hesitations, just start somewhere. You might find, as I have, that less can feel surprisingly satisfying. In the meantime, “Yes, it is cool. And you could totally do it.” At least that’s how I answer my friends. For the past two weeks, my toddler daughter has been asking if it’s fall yet. Every time she’d see a leaf float down into the yard, she would cheer, “It’s FALL!” And now it finally is! Like my daughter, I’m ready for a new season. 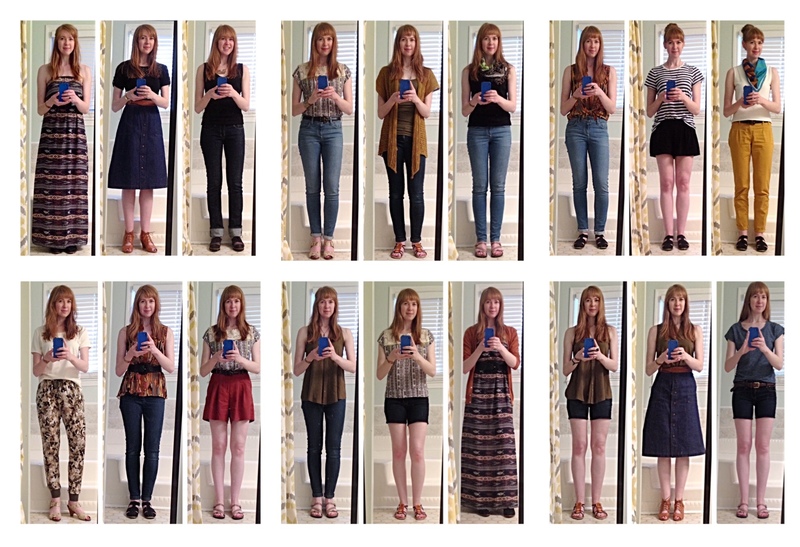 At this point in the year (and in my three month capsule wardrobe), I’m itching for a change. 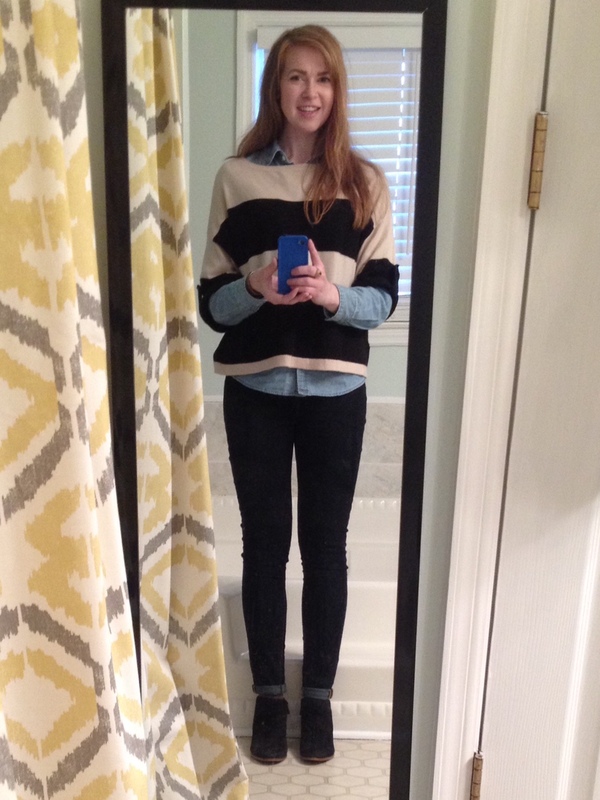 Fall is my favorite season, and the corresponding clothes are a big part of that. 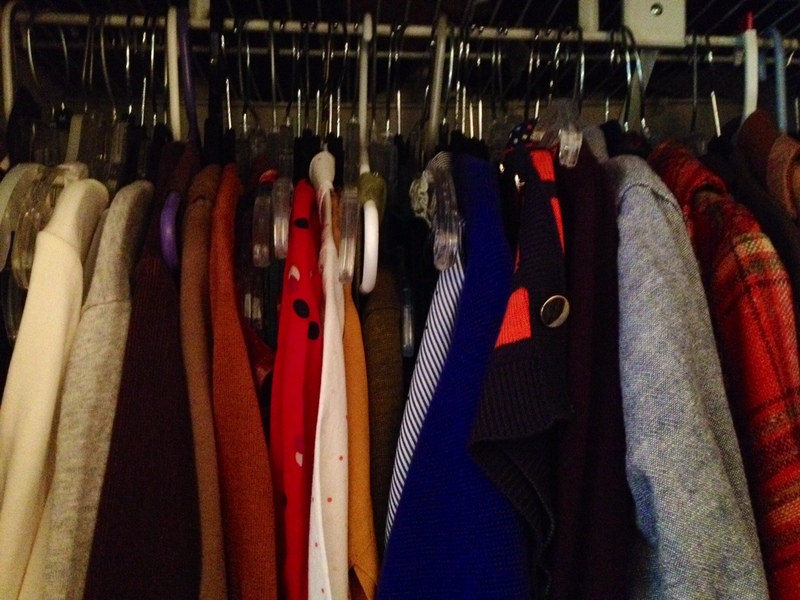 As October approaches, I am assessing my wardrobe from the last season and deciding what stays and what goes. 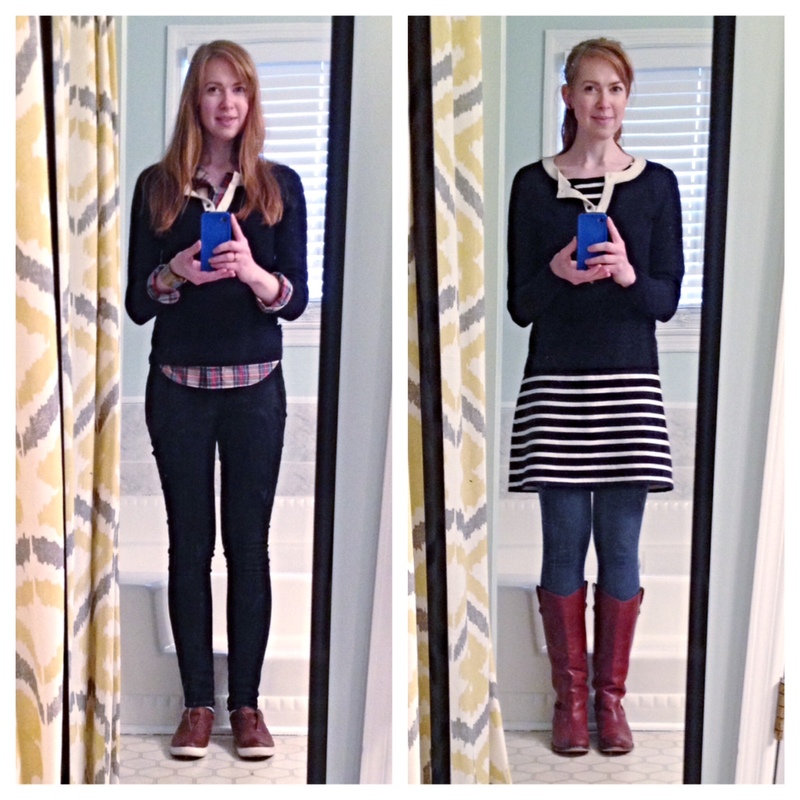 Wearing the same 30-something pieces of clothing for three months has taught me some things about myself. “Sporty” is not a word I would ever use to describe myself or my style, and with that acknowledgement, I’ll be sending my floral track pants and my printed sweatshirt on to new homes. Those outfits felt a bit more casual than I like, and wearing heels to dress them up was impractical for my daily life. 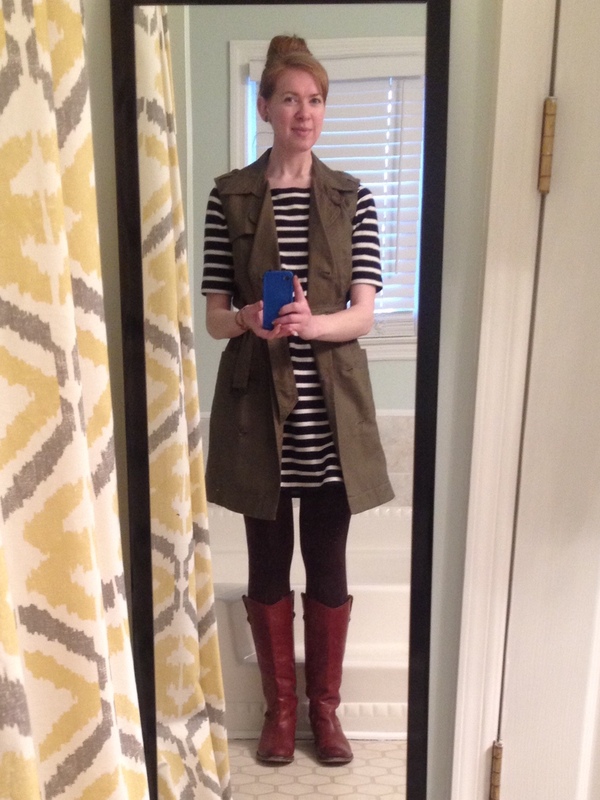 No big deal–I spent less than $15 to try out the look, so I don’t feel guilty about consigning or donating the clothes. I’m also ready to admit that there is a certain length of skirt I will not confidently wear without tights or leggings. I had one such skirt in my summer capsule, and though I wore it often in winter (with tights), I didn’t wear it once in the past three months. That’s okay, too. I’ll skip this skirt for my fall collection and maybe bring it back when the weather is consistently cool enough to wear tights with it. Several things have also worn out after three (or in some cases, six) months of regular wear. 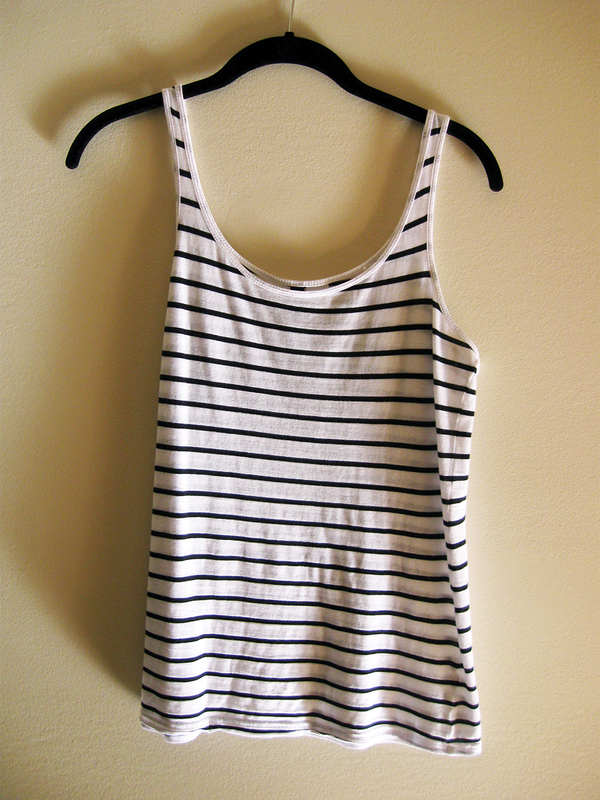 I have already replaced my striped tee, and I’ll be swapping my striped dress and striped tank for my fall closet. 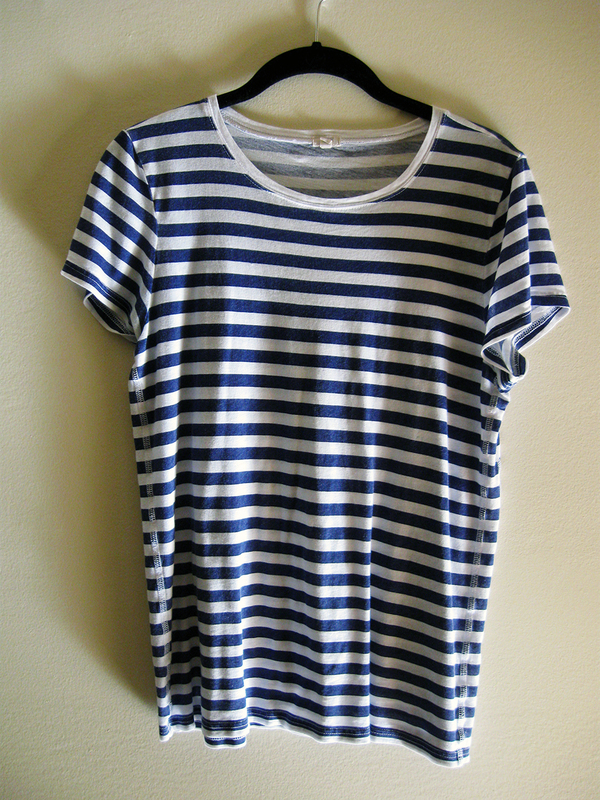 Hooray for new stripes! 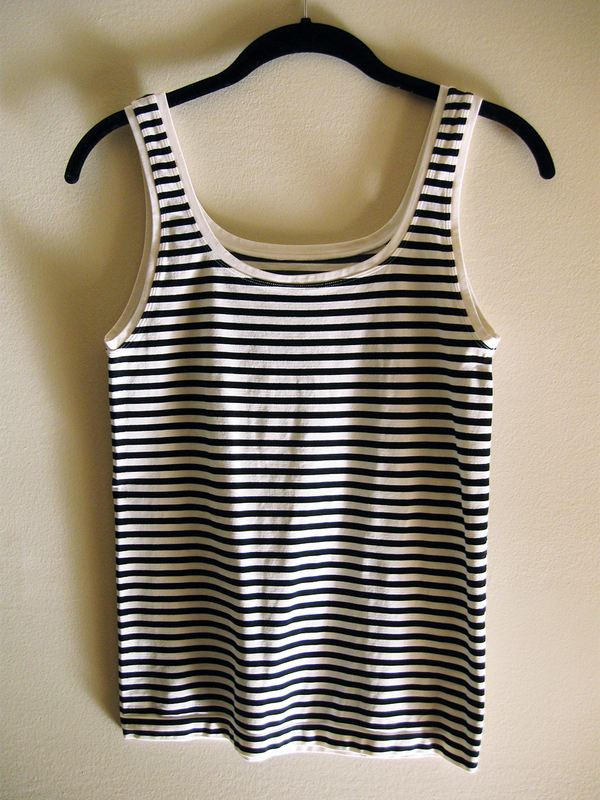 I bought the (nearly) new striped pieces from the thrift store, and I spent less than $25 on all three of them. Other retiring pieces include my black crochet top tee (too faded), my beloved beaded sandals (falling apart, and I’ve already glued them back together twice), and the light wash jeans. I usually wear dark wash jeans, but I thought a lighter wash might be nice for summer. 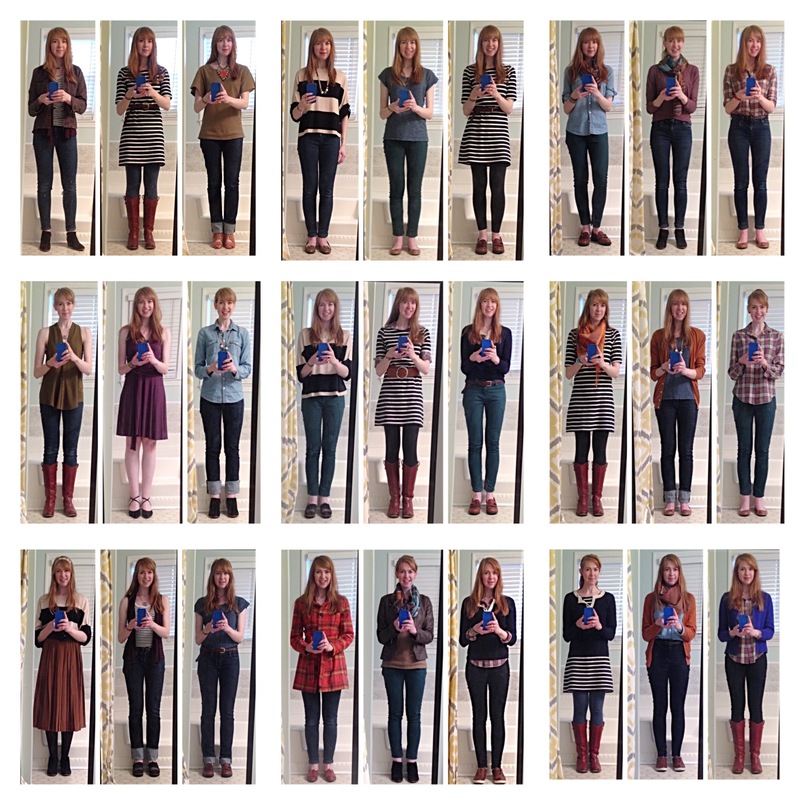 So many fashion bloggers made them work, and I felt inspired to give it a try. I paid less than $8 for those secondhand Anthropologie jeans, and it was worth it to discover that I do actually prefer a darker wash.
With the change in seasons, the worn out pieces, the mistakes, and the items I’ve been wearing regularly for months (some since March! ), I am packing up or giving away almost everything in my summer collection. Some of the pieces will go in the drawer until it’s time to reassess next spring. I’ve had some hits and misses in my wardrobe choices this summer, and I feel like I have a clearer understanding of my style. For summer, I included some pieces that I liked but weren’t my favorites; they seemed like necessary basics. For fall, I’m ditching that philosophy. I pretty much love every single thing that will be in my closet from October to December. 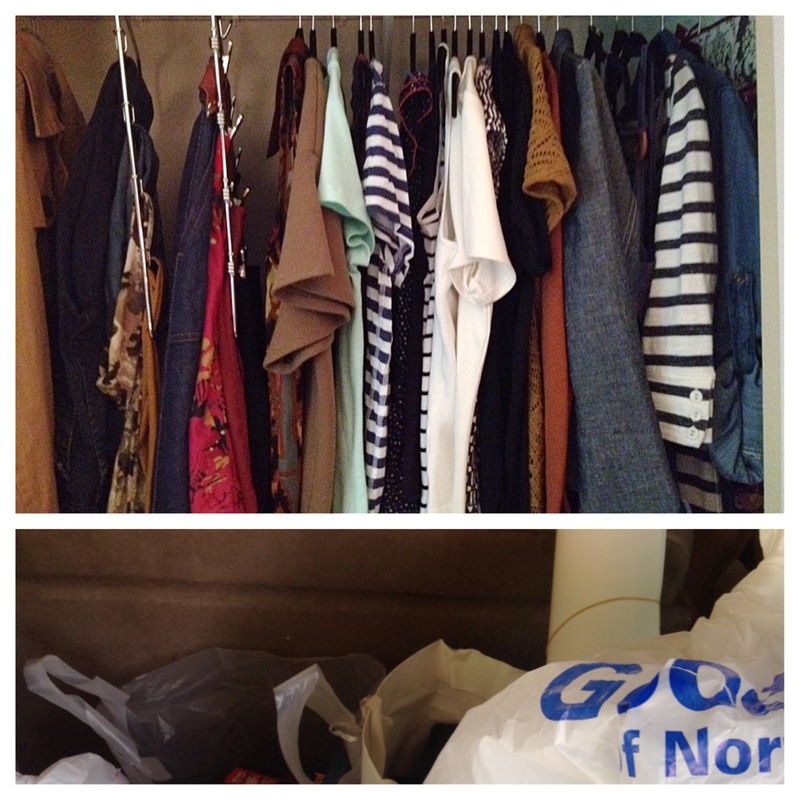 I feel happier with my closet overall, and I’ll be interested to see if I miss those basic pieces. In the meantime, I’ve started putting outfit ideas together, and nearly all the combinations–even the weird and quirky ones–feel especially like me. I can’t wait to share them. So…October (and thus a new season of Project 333) starts in a week. Are you ready to try a minimalist wardrobe challenge? My love of vintage started early. When I was six or seven, my dad gave me his old transistor radio. He showed me the dials, and we tuned in to hear The Beatles’ “Yellow Submarine”. That was the only music I ever heard through that little radio; every time I’ve flipped it on since, I’ve only gotten squeaks and squeals and static. This object became a treasure for its nostalgia and its aesthetics. 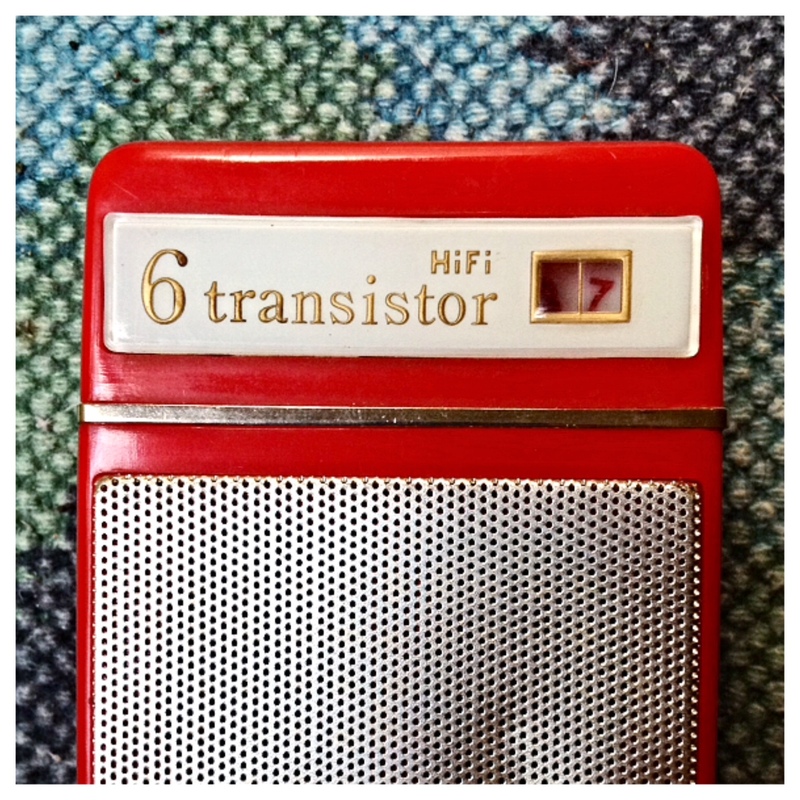 With its candy apple red plastic and shiny silver speaker, the transistor looked so different from the functional 1980s clock radio we had in our house. Hearing that one song over the airways became a magical memory. I also remember my dad telling me about hiding this radio under his pillow and secretly listening to rock ‘n’ roll when he was a child. When I see this radio, I see a story. When I was nine or ten, I went with my mom to a large antique market and made my first vintage purchase. 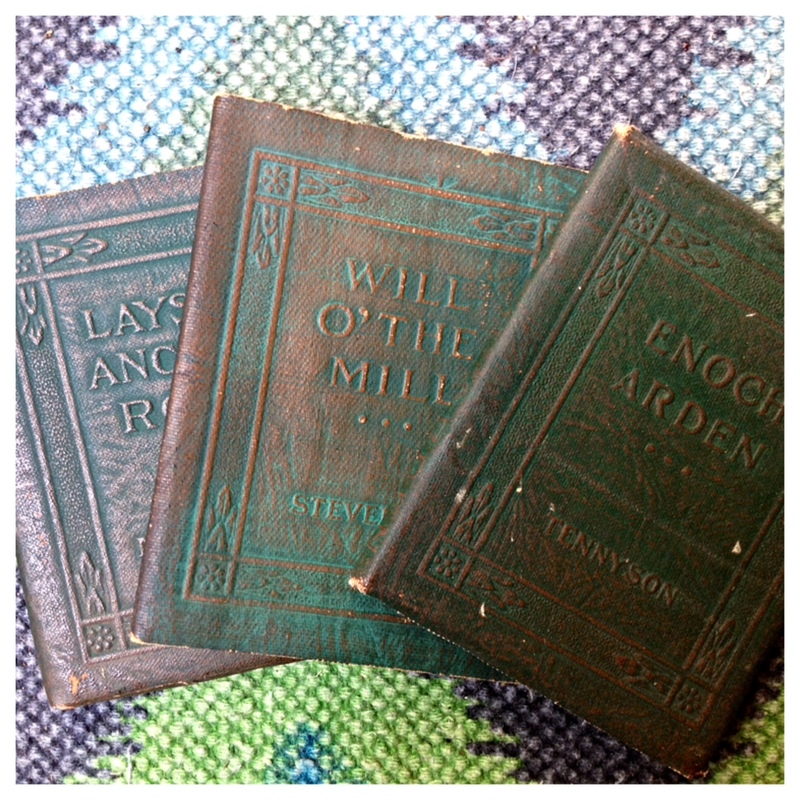 I found these tiny leather books that captured my imagination. They were small and beautiful. The embossed leather covers and the smooth printed pages felt important. With my mom’s money, I bought them and began my vintage collection and discovered my interest in thrifting. As I work toward simplifying my home and my life, I am considering the form, function, and significance of my possessions. The more I clean out and donate, the more I can appreciate the things that remain. These pieces obviously hold meaning for me. They will stay in my home, not tucked away in a closet but displayed where I will see and enjoy them. I will continue to clean out and donate to make space for these things that are important to me. Vintage items, even those not as sentimental as my radio or books, intrigue me because they have a built-in history. The unknown story behind these things piques my interest. Often the forms of vintage items bring back memories. I feel an attachment to history and humanity when I buy vintage. Buying secondhand also carries an element of redemption. I appreciate discovering forsaken or forgotten things and giving them a new life. Some of my favorite pieces are four oil paintings, all made by the same artist in the 1950s. This man was not famous and was likely a hobbyist, but his work spoke to me when I found it at a thrift store. I wish I could express to the artist that his work is being enjoyed more than half a century later. This is how buying vintage and simplifying coexist for me. As I bring in new (old) things, I let go of things that are less beautiful, less interesting, or less important to me. Some of these things (the transistor radio, the books) will stay with me forever. Others will remain in my house for a season and then travel on to someone else. This refining ebb and flow allows me to collect without becoming overwhelmed. Rather than dulling my space or my life, simplifying spotlights what’s important and makes space for the interesting and the beautiful. P.S. 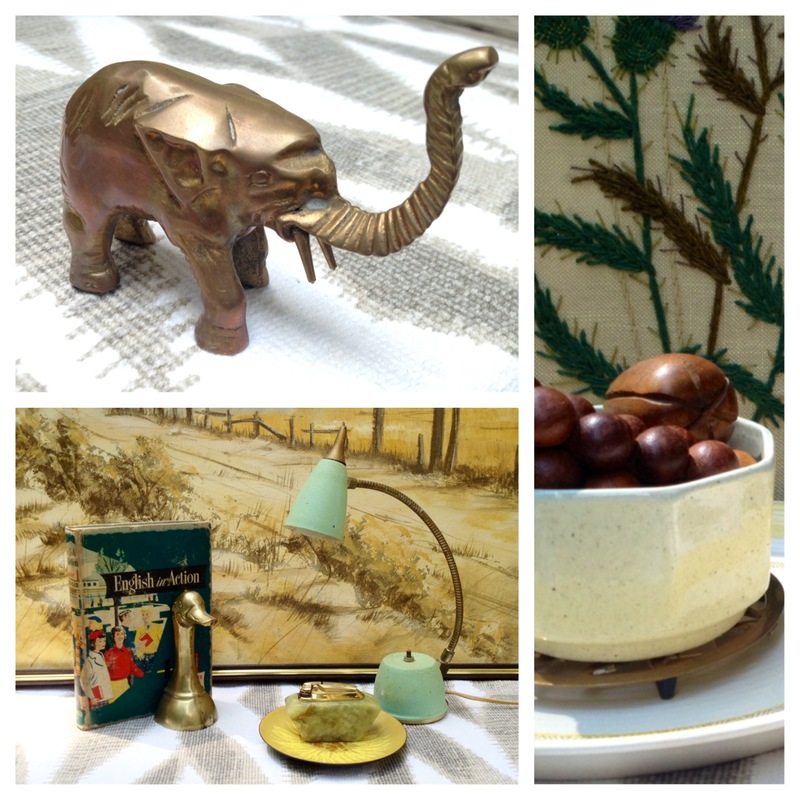 I love helping other people incorporate interesting and beautiful vintage treasures into their homes and lives. If you live in the Atlanta area, come shop at Salvage tomorrow. It’s a one day event, and I’ll have a booth there (Hark at Home) along with another forty or so vendors selling vintage and handmade.